I decided to make a post about mindfulness, because I see so many people around me either running ahead of life, or being left behind in their past. I catch myself sometimes doing this as well, but when I become aware and shift my thoughts, come back to the present moment and fully submerge myself within, the whole perception of life changes instantly. A lot of people are not even aware of this occurrence. Now, stop and think about what moment of the day have you fully experienced, observed and enjoyed without having rolling thoughts in the back of your mind about yesterday, or what are the plans for tomorrow? Sometimes we are given opportunities to experience wonderful events, but we fog them with constant worries, fears, etc. Have you come back from a vacation and you wished you could do it all over again, but this time enjoy certain moments in stillness, rather than worrying about flights, hotels, expenses, etc? How many of you have actually stopped and analyzed a present moment with full awareness and have gotten so excited over your observations? I am asking this because I have noticed in my OBEs I am constantly in such a state. Here, not so much and I am trying to change that. But since I consciously started observing present moments, I feel happier and happier. Thing make more sense, life lessons become very transparent and challenges easy to overcome. If you forget to stop and smell the roses, then write it down somewhere , so that you get reminded and with time it will become like a reflex. That will help those who are trying to AP to gain more lucidity during dreams. By spending time everyday to observe your surroundings, events, interactions (good or bad) your awareness will raise its frequency. And don't forget that the power is in the NOW. Good post, I have to keep reminding myself to enjoy little moments. Its so not easy to do though, as the good things are easy to forget....i had a lot of stress lately and started to just making a list of things on my phone that are good, even if its something small, and by the end of the day I read this least over again a few times. It helps. Sometimes stress and fear can overtake our lives and the best approach is to start counting our blessings. Also, when we take awareness to observe the present moment of a negative nature, we have a chance to analyze it better, identify the source and make a decision of how to solve the problem. There are challenges of different nature of course, some of them require acceptance (like I had to accept my father's death), some of them require action and bravery to make a change, some require hard work or to make a choice. "Be here now", by Ram Dass (http://it.scribd.com/doc/6531720/Ram-Dassbe-Here-Now) is a great book about living in the now. I recommend it to anyone who wishes to teach oneself on how to stop thinking about the past and the future. Simply start enjoying the only truthful moment we really have, which is right now. Float in the moment of now and you will float with the universe. I think you have highlighted a core concept fairly well. People think of meditation as a way to gain magic yogi powers, or develop abilities which will allow one to delve further into the spiritual, but they forget what it is at its very center and identity- the practice of learning to be, and not to need anything outside of the self to be profoundly content. People think of meditation as something which needs to be developed overtime over years or some such, but ironicly the greatest benefit it will ever provide is yours the first moment you grasp the basic concept. You gain a whole new perception of the world, that is for sure. For instance, take music for example...in present western society, it has sort of been relegated to a background affair, to accompany downtimes or various kinds of media; if one experiences music with a fullness of absorption, it can become a "religious" experience. It is is the same with speaking and listening with others. Very few people actually communicate in such a way that they are passive of mind, and fully absorbed in contemplating what the other is saying, without intellectual or emotional interference. To truly listen to another's words is to adopt their perspective as your own. That is the true nature of communication, and something that seems rare today. When you speak to someone with total presence of mind... there is no mistaking it! "The Gardener is but a dream of the Garden." Lightbeam I couldn't agree more. It seems living in the past causes depression. Living in the future causes anxiety. What's funny is most of the time you worry about future things they never come true. Your mind creates things that never even happen. Be present in nature is super beneficial to me. Well said Defiantly agree, Theres so many distractions in this physical life its hard to remember where your going, Other times your caught up thinking far ahead or prior you forget what it is your actually doing and why. " Do i need to be doing this? I dont even like this. " Taking the time to stop and gather my thoughts once in a while gives me great satisfaction. Then i can re-aline my thoughts and set off again in the correct direction. Try and live in the present. Thats where you will be happiest most aware and clear minded. In regards to mindfulness one of the most inspiring things for me is 'The peaceful warrior' by Dan Millman, a film/book I've seen mentioned around here a few times. The film is crammed with inthenowisms. Often times when I decided I'd be spending most of the day attempting to stay in the present, I'd eat breakfast and totally forget all about it for at least 5 hours To remedy this I started setting up an alarm that would make a short ring every 20 minutes and that wouldn't need snoozing. Eventually I'm guessing I won't need it and I'll remember to stay present at various times during the day. i'm 16, some days ago me and my first love decided to go apart, i cant describe in English how it felt, but i suppose all of you once had the same experience. i had a hard time, but since i read your post, i gave it a try. it helped me to process my feelings. now, if i think back at the time we were together (staying in NOW all the time stays hard, so i still keep thinking back now and then.) it feels like i'm over it, i can let her go. How many of you have actually stopped and analyzed a present moment with full awareness and have gotten so excited over your observations? I am asking this because I have noticed in my OBEs I am constantly in such a state. I was thinking the same thing too. In retrievals there's no time to drift off into mindless distraction, you have to think and be on the ball, constant analysis of the situation which brings you to the mindful potential above. Its totally dedicated to the quest at hand. In the physical this is not required the same. Too many lazy thoughts and the mindfulness fades into the distance, like living in a day-dream, the attention is lost, drifting into mental numbness. Those who are mindful are most likely to be the successful ones on our planet. Who wants a friend that pays no attention and can't remember what you asked seconds ago? @ Xanth, the extended experiences and the bathroom had me in stitches. I mis-read it initially. once the perspective was made clear it all fell into place. I agree with your post. It's quite amazing how if feels to simply follow your actions consciously and to be truly connected to Self. I didn't really understand what it meant to be mindful until I stumbled on the fact that being in the moment meant being conscious of not just your actions in general but your intent specifically, the movement of your energy as an action takes place. When you reach for a cup or flick off a light switch, you have to track your energy (metaphorically if you like) as it flows through your arm. This directs your intent and attention, and truly puts you in the moment, puts you in the action so to speak. Just casually watching the Now doesn't get you there. Full involvement with the process of motion, the moment-to-moment accomplishment of intention, is required. Thanks for the post. Sadhguru When you reach for a cup or flick off a light switch, you have to track your energy (metaphorically if you like) as it flows through your arm. This directs your intent and attention, and truly puts you in the moment, puts you in the action so to speak. Just casually watching the Now doesn't get you there. Full involvement with the process of motion, the moment-to-moment accomplishment of intention, is required. Thanks for the post. 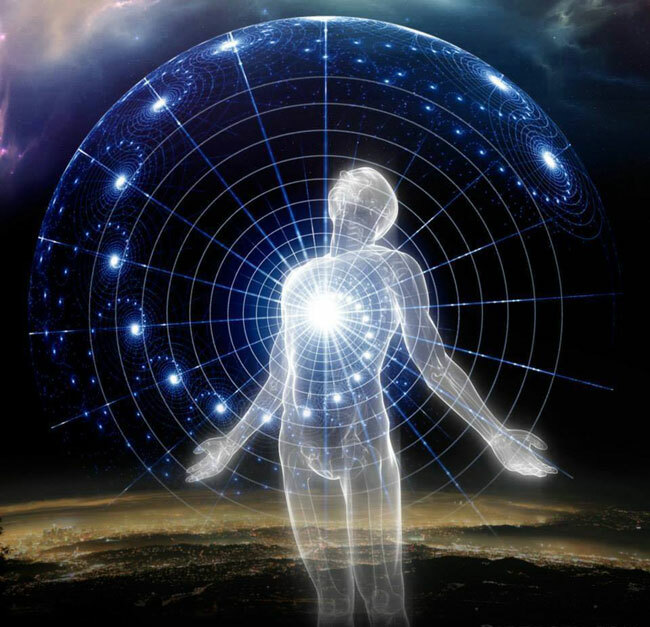 You can also "etherically" reach for that cup or flick that light switch off and you will still feel the energy as if flows through your "etheric" arm. Get used to that kind of "disassociation" from the physical body and you will find it much easier to maneuver in the "non physical", when you find yourself there. Thanks Lumaza. I do something similar. When I sit down to meditate, at the very beginning where I'm still trying to get thuroughly relaxed, I mentally project into the room. I wander through the house, focusing heavily on various items in an attempt to bring them into 3D/HD focus. I see this as my practice that is similar to what you describe. I believe this practice will come in quite handy when I eventually acquire the ability to immediately drop into Theta state and project at will. I believe that to be entirely possible with practice. Thanks again for the response.